You read that right! Best Buy Canada, which is well-known for selling today's top home electronics and newly added baby gear, now have expanded and offers toys and games for kids of all ages! Although pieces and parts aren't for every mom, we all grew up with it. My brother had tons of Lego and at one point even built the Olympic torch out of them! I can't build anything for the life of me, believe me I've tried. Hubby on the other hand can spend hours with our son building different things with Lego. I do like Lego because it gives a sense of learning with play. Kids can do whatever they want with Lego, build things only their young imaginations can come up with and Lego is also a great way to spend time together doing something as a family. Lego has changed over the years, today's Lego is not your typical block. Lego offers some great Lego play sets for all ages and stages including ones for girls available at Bestbuy.ca! Lego Hero Factory Bruizer ($15.99) - The LEGO Hero Factory has a monster to deal with. 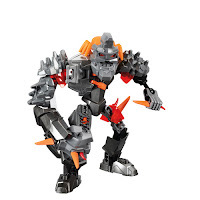 Bruizer is a stone-faced beast created by the evil brains and is armed with a swinging rock-smasher fist, rock shoulder armour and razor spikes! Watch out for him! Bruizer features a removable evil brain, swinging rock-smasher fist, spikes and rock shoulder armour. With 62 pieces and a sturdy posable design, Bruizer is geared toward ages 7-14 years old. Creator 3 in 1 Fierce Flyer ($17.99) - Let the imagination soar to new heights with the LEGO 3-in-1 Fierce Flyer. This ferocious bird of prey has detailed wings, gripping talons, and movable tail feathers and feet. If you don't feel like soaring the skies Fierce Flyer can be rebuilt into a scorpion or a beaver! The scorpion features movable legs and pincers, and a jointed tail with stinger! The beaver features movable tail, feet and arms! With three different animals to create and 166 pieces, Creator 3-in-1 Fierce Flyer is geared toward kids ages 7-12 years old. Lego Star Wars Naboo Starfighter ($12.99) - Take to the skies above planet Naboo but the Naboo Starfighter Lego set. Naboo's precious resources must be protected from the evil Trade Federation. Use this Naboo Starfighter mini model with blaster to defend this planet against worldly threats! 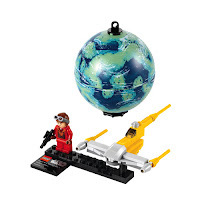 You can hang the Naboo planet from your ceiling and start your Star Wars Lego collection! The Naboo planet is 3" in diameter while the starfighter is over 4" long once built. A simpler model with 56 pieces (including Naboo pilot mini figure), Lego Star Wars Naboo planet and starfighter is geared toward kids aged 6-12 years old. 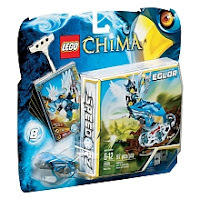 Legend of Chima - Nest Dive ($19.99) - Take a journey into the Eagle tribes treetop territory and test your skill! Attach Eglor onto the Eagle speedor, pull the cord and aim for the leaf ramp to fly up into the nest to claim the CHI for the Eagles! You can attach a power-up for improved precision! Set comes with mini figure, 2 weapons, Speedor, rip-cord, 6 CHI and 5 game cards. With 97 pieces this set is suitable for ages 6 and up. Lego Ninjago The Final Battle Temple of light ($89.99) - Prepare for the final battle in the land of Ninjago! Sensai Woo and the golden ninja Lloyd have uncovered the sacred four elemental blades which must be placed in the temple of light to awaken the golden mech for the final battle! This set is neat because you can build the temple and then the golden mech! 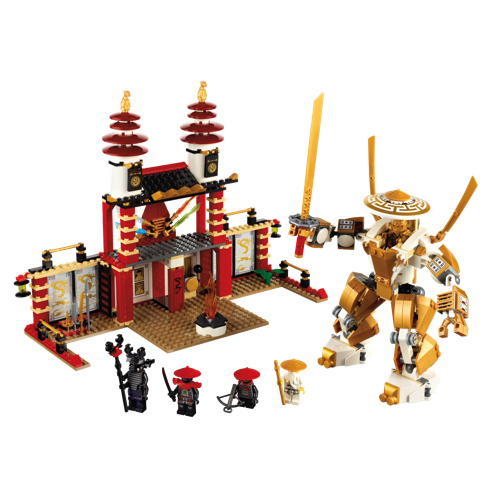 The temple of light set includes 5 mini figures, the golden mech with trap doors, weapons rack, gong and ladder! This set has 565 peices, geared toward kids aged 8 and up. 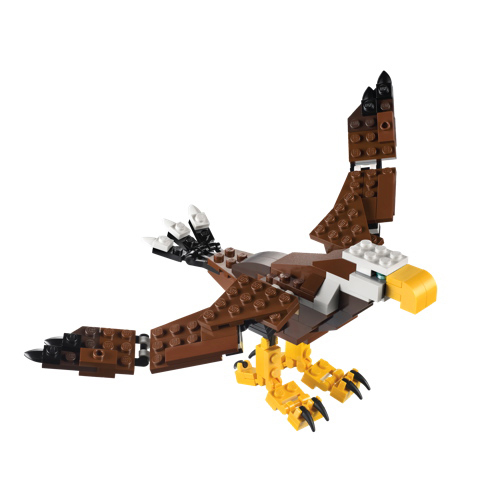 Each set brings something different to imaginative, creative play from flying eagles to saving the planet and beyond, the skies the limit when it comes to LEGO! Check out these and other great Lego sets online at www.bestbuy.ca! Show some love by following @BBYCanada on Twitter and Liking the Best Buy Canada Facebook page! Disclosure: Posted by AME on behalf of Best Buy Canada. Mentioned product was received to facilitate this review. All comments and opinions expressed on this blog are those of the author. When I was younger we had the big tub of legos, my brothers and I would spend hours building and playing with it. I remember when my oldest son was finally able to build one of the sets on his own. He was so proud! Going to the Lego display at Science World and seeing the miniature Lego replicas of famous real-life castles. They just blew my mind, that was SO cool. I'm always astounded by all the stuff one can create using Lego. Watching my son put together a kit following instructions and how proud he was of his masterpiece. My fondest lego moment was when my oldest got what lego was all about. He still can't complete one on his own, but with the help of his dad he does a lot of the work. My younger brother loved lego and had bins of it....We would all (5 kids) create villages with the lego. Lego was one of the things my brother and I would play for hours without fighting. Great memories! My fondest Lego moment was watching my son put together his first set. It was a car and he built it on his own. My fondest Lego memory is my youngest son playing with Lego and making amazing cars with them! My fondest moment when my boy was so busy building castles and he said he was going to build one for everyone in a family, so cute. My fondest Lego memory is watching my son play with his Lego for hours on end! He just loves taking them apart and creating new things with the parts! Building things on Christmas Day with my brother...now we're too busy, but my daughter will soon be old enough to build things with! I would have to say watching my 6 yr old show his baby brother how his Lego train works. So cute! one of my fondest moments was when my son and I finished (okay really him) a Lego hockey arena. My fondest is moments were building the same house out of my legos with my mom. Always a multicolored house with windows and doors and a balcony at top with the plastic trees, lol. I was so proud each time. My favorite LEGO moment was being able to create by myself the Star Wards ship LEGO my brother gave up on when we were kids. It ended up being mine instead of him!! I could say I was a LEGO natural. When me and my nephew put together his star wars lego. It took us 5 hrs but the time together creating something was so special! playing legos with my children when they were young and still playing with my grandchild. I love legos . Playing with my son making towers. We took our boys to LEGOland this past December and it was priceless to see our oldest son's excitement at all the lego creations, rides, etc. He's the biggest LEGO fan and for him this was the ultimate experience! My fondest lego moment was 2 snowdays in a row, myself and my boys stayed in our pjs all day and built a lego city! building a pretty cool lego spacecraft when i was a kid. My fondest LEGO moment was when I was playing with the basic blocks that I had and I created houses with windows and a door, and put out on the green mat the pretty flowers, trees, and a bench. I could spend hours working on it. My husband recently found his Lego in the attic on the farm where he grew up and passed it on to our 6 year old daughter. I love seeing my son's eyes light up when he creates something and the pride he takes in showing it off. My most dear and fondest moments growing up with Lego was spending hours building stuff with my (much older) brothers. It was during these moments that I actually felt like I had siblings. My brothers were considerably older so I often felt like I was an only child. 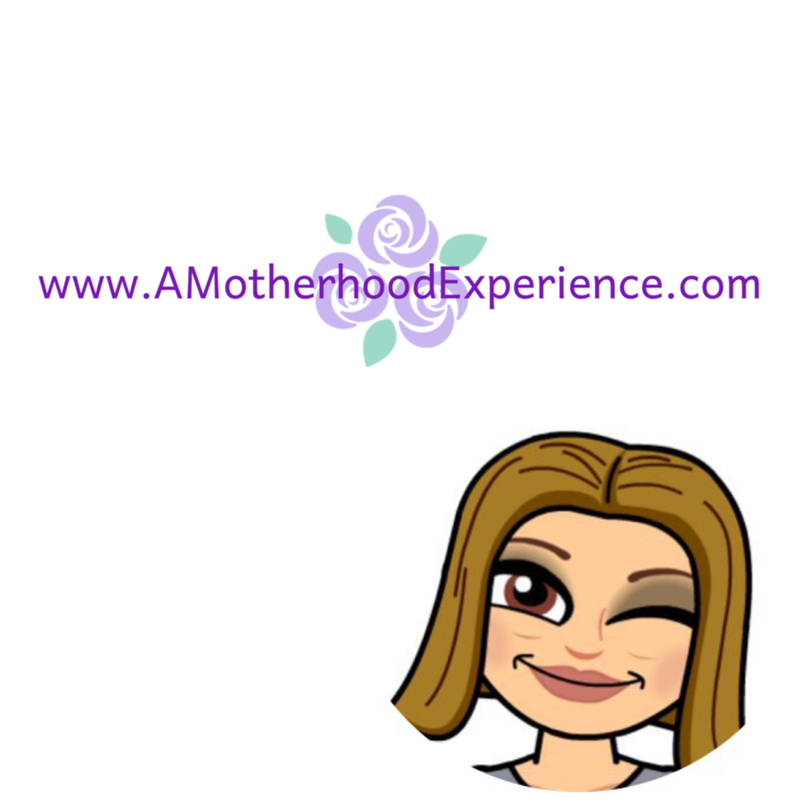 My daughter is an only child and I look forward to our small moments when we play (like kids), I know that she would love to have a sibling but I'm as good as it gets....which is why play time is so important. My fondest moment is 3 years ago when we went to visit my sister in law and her 2 boys were at the age where they loved to play with Lego and had such great imaginations. We played lego with them for hours! My fondest lego moment was when my brother got a box of lego for Christmas and I got a barbie. I wanted the Lego and to cheer me up, he made a lego car for my barbie to ride in. My fondest (most satisfying) LEGO moment, has to be when I finished the build on the Star Wars LEGO "Millennium Falcon" set. It's not the biggest LEGO set I've ever built, nor is it the most complex. But it's definitely the most fragile! Entire sections would fall off at the slightest vibration. The total build time was probably twice what it would normally take me to build another set of similar size, and I was really happy when it was completed! Fondest Lego moment is playing the Lego series video games, Lego City Undercover for the WiiU is great! Playing Lego with my two brothers was always a highlight. We built a pirate ship, it was awesome! Playing for hours on my own or with my friends. I remember when we were young me and my brother would sit down almost everyday after school while we were waiting for dinner, building castles and houses!!! I remember playing for hours when I was a kid creating, building and using my imagination lego played a big part in my childhood many great memories! I had a huge firetruck (to me then) that I proudly displayed on top of the drawer. It was indeed gorgeous and so fun to build. Making huge towers that wouldn't topple over! Stepping on them of course! bringing legos to school for show and tell.